Have you started reading this book yet? I've read and reread this entire book already this summer. You should see how OLD it looks from all of my highlighting and notes in the margins. Maybe I'll show you with Chapter 4. Maybe not. This chapter is being hosted by My Second Sense and Making It As a Middle School Teacher. Michelle at Making It has a terrific video showing her reflection. Let's talk about Math Stretches, shall we? My first thought is routine. Routine, routine, routine. Students need routine in order to feel comfortable in a classroom. They need to know what is expected and need to know how to achieve the goals we set for them. 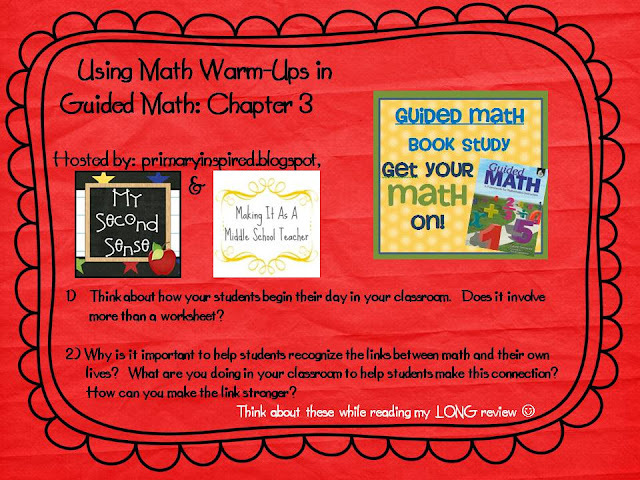 So, knowing that I am going to have three separate classes of math next year, I began to think about how I would establish that routine with classes that come in and immediately need to get to work. I love the idea of having a daily data collection and analysis math stretch. So, I will probably start the day with them coming into the room, setting up (dropping off tote bags, getting settled) and then they will go to the data collection chart and mark their response. I am going to make the glass beaded magnets I'm seeing on Pinterest and they will simply take their magnet and slide it to the "answer" for the question. For example, on day one the question will simply be graphing the attendance. Slowly we will add more options so that the data collection will require more thought as to how to graph the data. (Favorite sport, favorite ice cream, etc.). The Calendar Board is explained beautifully in this chapter, too. I found myself nodding throughout this chapter, too. Lots of notes in the margin. I'm going to post more about Calendar soon, too. I'm leaving you with a tip. 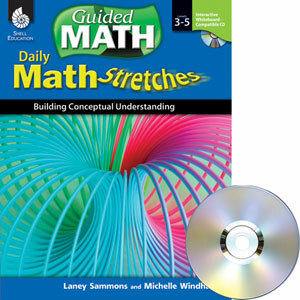 Did you know that the author of this book has a "Math Stretches" book available, too? Yes, that's in my online cart as we speak. So excited I found this post! I've been searching for some PD books to read for the summer. 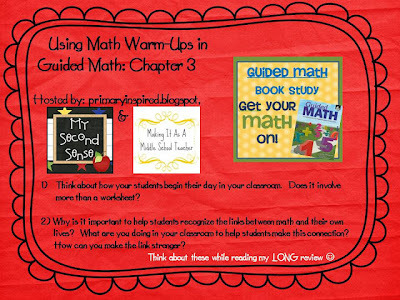 I just ordered Guided Math and Building Mathmatical Comprehension. Hi Elizabeth I just found your blog. I will be getting that book. Guided Daily Math stretches. We all right they do need routines established. I will be teaching one 4th grade math class and the rest social studies. I am looking for something for them to do when they first come to class, the first five minutes is important.